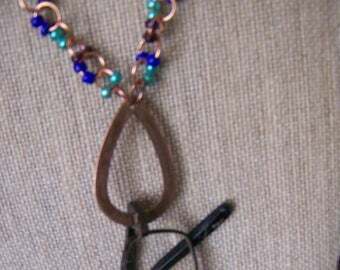 Pendant width - 1 1/8"
Lobster clasp - May be replaced with ribbon if your skin is metal sensitive. 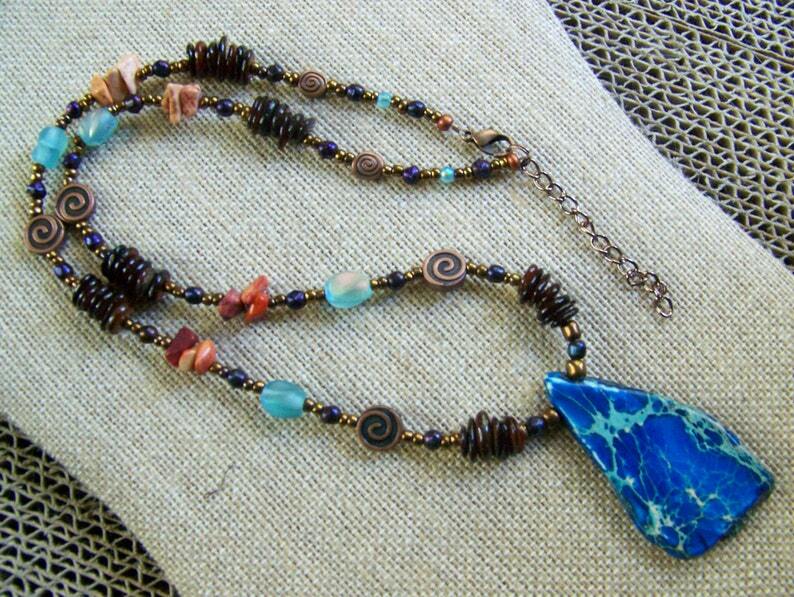 Natural stone pendant necklace of blue dyed jasper has copper swirls to keep it company, along with brown seed pods & orange howlite chips for a natural, primitive tribal look, simple, but can be a conversation poece! Think of the Hawaiian Islands. This has a casual flare but is easy to dress up your outfit. 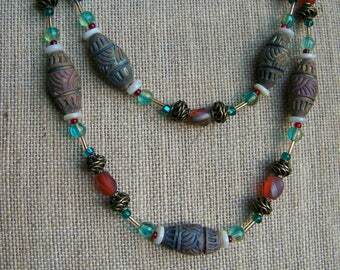 Great as a gift for Kwanzaa, Hanukah, Christmas, birthdays, or to treat yourself! ** Your purchase will arrive in tarnish resistant batting, in a box made in the USA from recycled materials , then placed in a padded envelope I have saved from packages sent to my house, In order to lower my environmental impact... & to help keep prices low for you. If you order more that one item, I could put them all in one box, if you'd like. *This ships via USPS, during the winter holiday shopping season, requiring your signature to assure you get it, & not the parcel thieves. 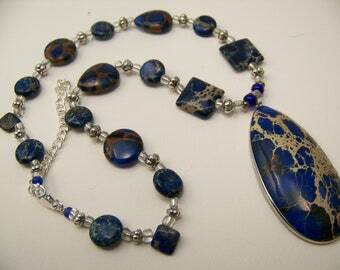 Imperial Jasper provides protection to reduce fears & insecurities. Jasper is known as a stone of gentleness, comfort, & relaxation, the nurturing stone, smoothing out & enhancing mental processes. It has prosperity vibrations related to agriculture, used as strong but gentle protection magic, & for travelers. Native Americans traditionally used it for rain making. Gaining the name “make up stone”, it can bring internal & external beauty into life & specific situations. Balancing yin/ yang energies, it can be helpful in many areas of life bringing emotional healing, peace, kindness, comfort, & ease, especially healing grief, emotional disturbances, & trauma. 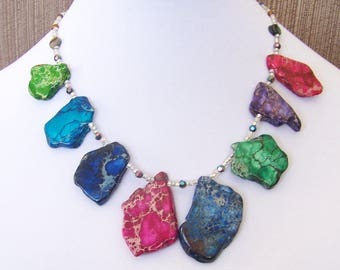 In the physical realm, jasper is used in crystal healing particularly for the liver, kidney, gallbladder, stomach and intestinal problems including heartburn, IBS, and acid reflux, hallucinations, longevity, epilepsy and seizures. It is also used to enhance healing of any kind as well as pain relief. Is this is a gift for a winter holiday, birthday, anniversary, or another occasion? I will try to gear the wrapping for that person or event. This is one of the most fun pieces of jewelry I've every owned. I love it for it's design, quality and accurate portrayal of a beloved Easter confection that I will enjoy for years to come. I highly recommend this crafter and seller. Amazing colors, very special, Well made. It enhance any clothing. Great sign! Well done, and thanks for the communication with working through some alterations. Bien reçu, intact et joliment emballé. Je voulais l'offrir, mais je l'ai gardé pour moi. J'adore la couleur bleue des perles. Merci. ** Your purchase will arrive in tarnish resistant batting, in a box made in the USA from recycled materials , then placed in a padded envelope I have saved from packages sent to my house, In order to lower my environmental impact... & to help keep prices lower for you. If you order more that one item, I could put them all in one box, if you'd like. ** If you'd like gift wrapping, please convo me the occasion & any message for the recipient.